I hope everyone had a nice weekend and here we are at the start of a new week. Yesterday I went into New York City to shop with my daughter. It was a cold and rainy day here in the city but we both had fun. This is where we started. 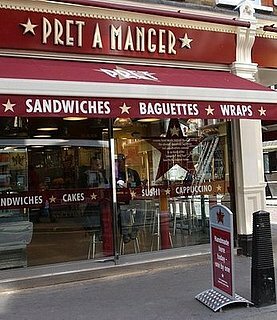 The first stop was lunch at Pret A Manger and it was so good. We both had egg salad sandwiches, soup, bread, and drinks. The next stop was to the Lion Brand Yarn Studio and they have such a cute window display decorated for Spring. 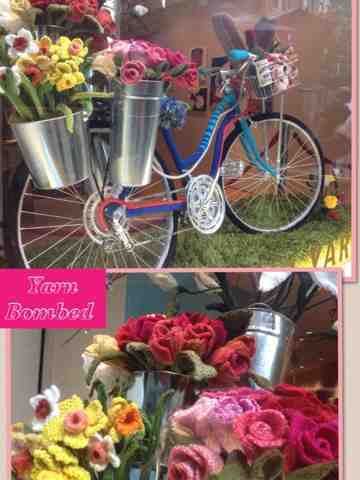 They yarn bombed a bike decorated with flowers and they even decorated the wheels and the bike basket with yarn. Inside the store was a display of a wedding theme. 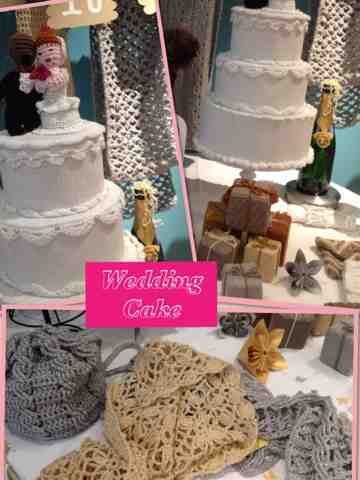 They made a cute wedding cake and presents made out of yarn. If you are in NYC do not miss this window display, it is a must see! Here is a picture of all the colorful yarn that I bought. When my daughter saw all the yarn she said that she loved the yarn and all the pretty colors. She also surprised me with wanting to take knitting lessons over the summer there. Now I might have a partner to knit with! 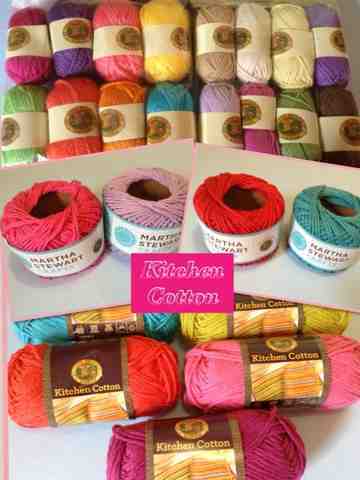 I purchased a lot of kitchen cotton both from the Martha Stewart line and the Lion Brand Kitchen Cotton. The colors are amazing and so bright and cheery. I am making a lot of dishcloths because Jill from Being Spiffy is hosting the 52 Weeks of Dishcloths. We are already on to week 8 and now I have to get busy and start working on this weeks dishcloth! Come and join the fun because dishcloths make great gifts. Don't forget end of the school year is approaching and you could make one to give to the teachers in a gift basket with cute dishwashing soap and hand cream. I am so jealous. NYC at your finger tips...we have boston nearby and it is fantastic, but NYC? Lucky you. Now as for dishcloths. You have inspired me. I am going to make some too. I love them like no other. Your blog is looking great! Great post! I've heard about the Lion Brand store and the outlet store too but haven't had the chance to visit-- maybe some day-- so thanks for sharing a glimpse inside! Welcome to blogging and you have a new follower. I love the beautiful colors you bought. The store displays look amazing! Would love to see them in person. I really should learn to knit. Thanks for sharing with SYC. I am quite jealous, as I would love to shop like this in NYC! Wonderful inspiration!